Regardless of where you stand politically, it's hard to dispute that Barack Obama and Joe Biden have developed an endearing bromance over the past eight years of leading the nation together. As the country reels in the wake of Donald Trump's electoral upset and wonders what to expect when Donald Trump and Mike Pence enter the White House, the friendship between our current president and vice president has become a source of comfort to many Americans. An outpouring of imagined conversations between Obama and Biden has delivered lighthearted laughs at a time when many hearts and minds are heavy with questions and concerns about the near future. Many of the fake conversations center on what people imagine the two are thinking and feeling about Trump's impending commander-in-chief status, while others stick to super casual, everyday conversations and silly jokes between the two. Biden is consistently portrayed as a sentimental goof with an ample supply of bad puns, while Obama plays the level-headed eye-roller trying to comfort Biden through the transition out of the Oval Office. 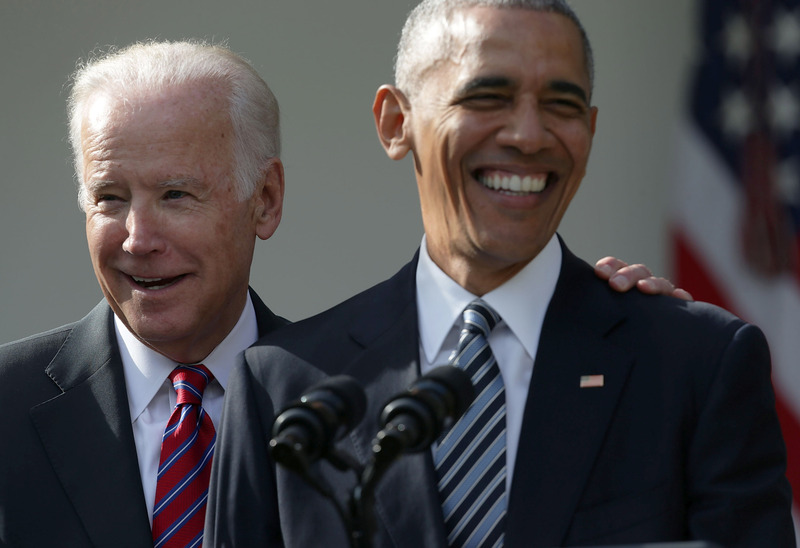 If you're due for a dose of levity, a respite from the weight of the current state of the union, check out these 13 fake Obama-Biden quotes. I wish Biden actually told this joke. And I'd like to think that Obama's cure for boredom is smooth jazz. Here, Obama tries to rein in the vice president. It's always 5 o'clock somewhere, though. Looking out for the president-elect. Biden thinks very highly of Obama. A little too highly for the latter's comfort in this imagined scenario. Just one man in black, sadly. In this slogan revamp, Biden portrays a president-elect who will make you work for your pizza. Obama is not impressed. Biden's well-documented love of ice cream takes a vindictive turn. Joe gets a bit self-conscious about the meme explosion, and Obama explains the subtle art of coping. A not-so-subtle statement regarding the incoming VP's stance on gay rights. Unfortunately, we haven't been privy to many actual exchanges between Biden and Obama, but we can rely on our imaginations. Obama-Biden fake quotes have provided a much-needed break for many of us, and are a fine way to pay tribute to one of the sweetest friendships on the Hill.